Speech Therapy Giveaway From PresenceLearning! I am really excited about today’s giveaway! I was contacted by PresenceLearning, a company that provides live online speech therapy services for K-12 students. You can check out their web site here. I was not familiar with the company so I contacted a former co-worker of mine who is a speech therapist to see what her thoughts were. It turns out, she contracts with them now. I would have loved to take them up on their offer for a free trial for Connor so I could give you a first hand account, however, with Connor being so young, and the fact that his speech therapy sessions are very hands on and he frequently tries to crawl away…not sure that would work for him. PresenceLearning is the leading provider of live online speech therapy services for K-12 students and is now offering online occupational services as well. PresenceLearning strives to match the right therapist with the right child regardless of location. The company has partnered with school districts to offer web-based access to a growing, nationwide network of over 300 highly qualified speech language pathologists (SLPs) and occupational therapists (OTs) via live videoconferencing combined with the latest in evidence-based practices. PresenceLearning is also expanding their offering to serve parents and guardians of children with special needs. • PresenceLearning will provide winner with headsets and webcams and do the tech checks and make sure they are all set up technically. When they are done with the trial, they do not need to return the headset and webcam. • The states where the services will be taking place so we can make sure we have a licensed SLP to serve them in that particular state. After we have this information we will put you in touch with Aaron Skiies from PresenceLearning and get the winner connected with a clinician — one of their top SLPs who will talk to them about how it works and what their child’s needs are. This SLP will be the one to schedule the actual dates and times for the sessions. Leave a comment expressing your interest in winning the speech therapy trial and the age of the child you want it for. if you’re comfortable sharing, please tell us why you’d like to try it…I will not require that particular detail out of respect for some people’s desire for privacy. I will randomly draw a winner on Wednesday October 23. I will try to contact winner by e-mail, as well as posting here. If I do not hear from you within four days, I will select a new winner. Winners of the “Leaders Open Doors” Giveaway! Apologies for being a day late with the drawing. It’s been a wild weekend in regards to the house being on the market. More on that this week when I have the details. These commenters will receive a copy of Bill Treasurer’s book “Leaders Open Doors.” Please e-mail me at pin.the.map@gmail.com by August 2 with the address to mail the book. If I am unable to get in touch with a winner by Aug. 2 I will select another commenter. Note from Mixed Up Mommy: I’m pleased to have author Bill Treasurer as a guest blogger today. Proceeds from his latest book will benefit children with special needs. I also get to do a giveaway with five copies of his book! If you would like to receive a free copy, simply leave a comment on the post. I will draw five names on Saturday July 27 and contact the winners, as well as post them here. Check his book out on Amazon. For the last two decades I have taught leadership development to thousands of executives across the globe. I’ve written books on leadership and courage, and a widely used courageous leadership training program. I even did my graduate school thesis on leadership. Despite all of the wonderful leadership lessons that my clients have provided me, few people have taught me as much about leadership as my nine-year-old daughter Bina. Bina (rhymes with Tina) has cerebral palsy. She is also profoundly deaf. Both challenges are the byproducts of a virulent staph infection she contracted at the hospital just days after she was born. Americans with disabilities make up the largest minority population in the United States. Some 54 million Americans have a disability of one form or another. And anyone who has been graced by the company of such people knows what a blessing it can be. It can also be heartbreaking. During Bina’s first year, it became clear that she was lagging behind her twin brother, Alex, in significant ways. Alex rolled over. Bina didn’t. Alex crawled. Bina didn’t. Alex responded to our baby talk. Bina didn’t. Alex received adoring smiles from strangers. Bina didn’t. The first leadership lesson Bina taught me happened early on. At first, all I could focus on was Bina’s disabilities, which caused me a lot of anger. I’d think, “Why did this happen to her? Who caused this?” and “Why can’t she do the things her brother can do?” Then, just before she turned two, a friend of mine wisely suggested that I start focusing on Bina’s abilities, not her disabilities. When I heeded my friend’s advice, Bina started progressing much more rapidly. In some strange way, by focusing on her disabilities I had become a block to Bina’s progress. I had pigeonholed Bina as a “handicapped” person and had started treating her as such, often by babying her. Once I started focusing on her abilities, my parenting shifted from taking “care” of her, to fostering her strengths by encouraging her self-reliance. Leadership lesson #1: People go farther when you focus on what they can do, not what they can’t. The next leadership lesson came when Bina was four. At that point, Bina was still in a stroller because she couldn’t walk. Her brother Alex, on the other hand, was turning into a rambunctious little Ninja gymnast. To encourage his aerial hijinks we set up a trampoline in our backyard. I’d teach Alex trampoline moves while Bina watched from the sidelines. At the end of our little practice sessions I’d always make time for Bina too, holding her little hands and bouncing up and down. Recognizing that we were onto something, Shannon and I began to set aside time each day to walk with Bina on the trampoline. Before long, three steps turned to five steps, and five turned into ten. Then we set up a long runner of matted cushion on our back deck, figuring it would help her make the transition from the spongy trampoline surface to the hardwood floor. Drawing on her trampoline successes, Bina cautiously stepped out on the runner. Soon she was taking more steps on the deck than she was able to on the trampoline. It was all terrifically encouraging and inspiring. By setting up our backyard trampoline, we created a safe way for Bina to do something that she had previously felt was too unsafe to do. Walking, formerly a frightening and potentially injuring experience, now had become fun. Notice that the action we wanted Bina to take (walking) hadn’t changed. What had changed was the consequence (and only temporarily). The spongy trampoline surface was far more forgiving than our hardwood floors. When we surrounded the same action with safer consequences, Bina became much more willing to take a risk. Leadership lesson #2: If you want people to take more risks, make failure safe and success possible. The third leadership lesson involves communication. Bina has had a cochlear implant since she was two-and-a-half. The technology has been a wonderful blessing in that it has allowed Bina to hear and acquire language. Along with intensive speech therapy, the cochlear implant has made communication with Bina possible. Still, Bina talks differently than most people. Her deafness impacts her intonations and her cerebral palsy affects the use of her tongue and mouth. So communicating with Bina takes a lot more patience and listening. It is not uncommon for her to have to say something a few times before you fully understand what she’s saying. Few things provoke other people’s judgment than how one communicates. Northerners make judgments about southerners due to dialectic differences in pace (northerners tend to speak faster than southerners). In the same way, it’s common for people to make judgments about the intellect of people with special needs because they often talk differently. This is especially true for people who have cerebral palsy whose faces often contort and shift when they talk. But when you take the time to listen deeply to a person with special needs you get to know their preferences and perspectives. Over time I’ve learned that communication works best when I communicate with Bina on her terms, not mine. This requires adjusting to her cadence, intonation, pace, and unique dialect. Communicating with Bina on her terms has allowed me to discover how wonderful, caring, and beautiful Bina is, and it has deepened our connection to one another. Leadership lesson #3: Effective communication results from patience, listening, and setting aside your own communication preferences. Being Bina’s dad has been one of the greatest joys, and greatest educations, of my life. I’ve learned powerful lessons about dignity, unconditional love, prejudice, and leadership. You couldn’t pay me all the money in the world to take Bina away from me, though I would give you everything I own for her to not have had to suffer through her challenges. In the end, though, my job is to love Bina as much as I can love her to help her go as far as she can go. To me, that’s the ultimate job of a parent…and a leader. 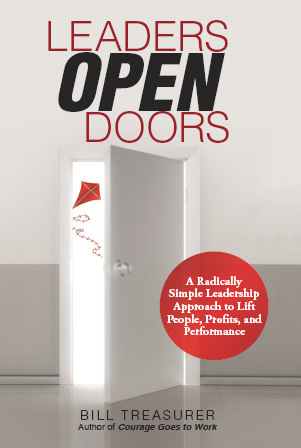 Bill Treasurer is the author of Leaders Open Doors, which focuses on the responsibility that leaders have for creating opportunities that cause people to grow. The book is carrying out its own message: 100% of the royalties are being donated to programs that support children with special needs. Learn more at www.leadersopendoors.com. Bill is also the author of Courage Goes to Work, an international bestselling book that introduces the concept of courage-building. He is also the author of Courageous Leadership: A Program for Using Courage to Transform the Workplace, an off-the-shelf training toolkit that organizations use to build workplace courage. Bill has led courage-building workshops for, among others, NASA, Accenture, CNN, PNC Bank, SPANX, Hugo Boss, Saks Fifth Avenue, and the US Department of Veterans Affairs. Contact Bill at btreasurer@giantleapconsulting.com, or on Twitter at @btreasurer (#leadsimple). Winner of the Dermagist Giveaway!!! As promised, today I am announcing the winner of the Dermagist Clarifying System giveaway! Here is a video of me pulling the name. Does my lip always go up on the side like that? I don’t generally make close up videos of myself so I wouldn’t know. Not sure I care for that… haha. Caffeine Please at Did I Earn A Smile? Please e-mail me at pin.the.map@gmail.com and let me know the address to have the company mail your prize to! Everybody, please check back. I hope to have another Dermagist giveaway in a couple months! Review of the Dermagist Clarifying System and GIVEAWAY!!! Woo hoo! I get to to do a giveaway today. I feel like a real blogger now! Of course, the price is that I must reveal the shocking secret that my skin is not…gasp…perfect. 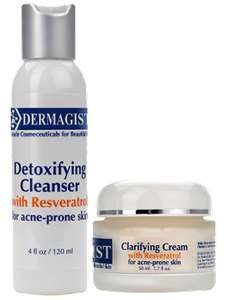 The Dermagist Clarifying System is geared for acne prone skin. Now, I don’t have acne, but I certainly do have my problem areas and breakouts. In the interest of full disclosure, I received these products at no cost in exchange for writing a review. I was a little nervous. What if I hated it? Awwwwkward! I’m glad to say, I’m pretty happy with the results. I started using the product on May 4. Right away I felt like we were going to have a positive relationship because of the word resveratrol stamped on the containers. Hey now! 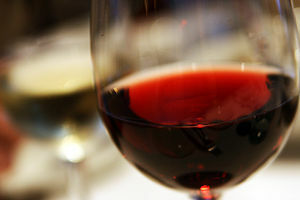 Isn’t that the magical anti-aging anti-oxidant found in red wine? The one all the magazines have been touting? Research is still in progress, but it’s believed to have many health benefits, although the degree of effectiveness and best method of consumption is still being studied. But anything that can be found in wine is alright by me. The instructions tell you to use it twice a day. I’ll be honest. I’m a once a day kind of girl, unless there are extenuating circumstances, like exercise…so in other words, once a day. My results are from using half the amount directed. First you wash your face with the detoxifying cleanser, which I do in the shower. I HATE washing my face at the sink. I don’t know why, but I’d rather take a full unnecessary shower to get my face washed, rather than stand at a sink trying to keep water from dripping all down my front. I like it; it has a nice citrusy smell. My face felt fresh afterward. But for me, the clarifying cream was where the magic happened. I can’t say no pimples tried to break through in the past month, but I can say that the cream stopped them in their tracks. The most recent product I had tried for getting rid of blemishes quickly was the Target version of those benozoyl peroxide creams that you’re supposed to dab sparingly as needed on pimples. I’ve also tried name brands like Clearasil. The problem is that while those do dry out and shorten the life cycle of the pimple, within a couple uses, my skin is is flaking and begging for moisturizer every five minutes. 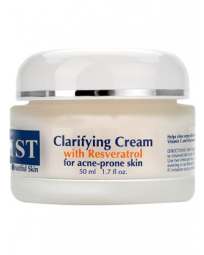 The Dermagist Clarifying Cream does the job of shortening their life WITHOUT making my skin look like I just crawled out of the Mojave Desert. This is especially good for me because I’m a compulsive picker. I can’t leave anything alone. My husband is constantly slapping my hands away as I absently pick at my face. I’m not gonna say I went cold turkey, but by preventing these blemishes from turning into Godzilla, my fingers definitely had less to work with. And my concealer spent a lot more time in my bag. 1. Please “like” my Facebook page Mixed Up Mommy if you haven’t already. Look to the right column of my blog and you will see the link. 2. 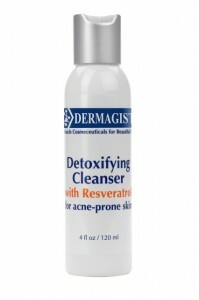 Leave a comment on this post saying you’d like to win the Dermagist Clarifying System. Comments will be numbered according to order left. I will pull a number out of hat, jar, bucket, something lying around the house…look, I said I got my face together, not my life. 1. That the winner “like” their Facebook page and comment why you like their products or are excited to try them. 2. You cannot have won a Dermagist giveaway before.